Now I am not one to toot my own horn and say that what I do with my home, my projects and what not is amazing. But I can say for sure that this is not (in my opinion) one of my best projects. First of all it is not even a project. It was a share on my tour. A picture amongst many. Also it was a very big afterthought with our house. But people like their organizing. So I decided to break down this little corner of my hallway a little more. Also maybe we can together figure out why this is my number 1 pin? So this is how it looks now. And yes, before you ask it is ALWAYS this neat and organized… totally…. This is right off of the laundry room, in our hallway. 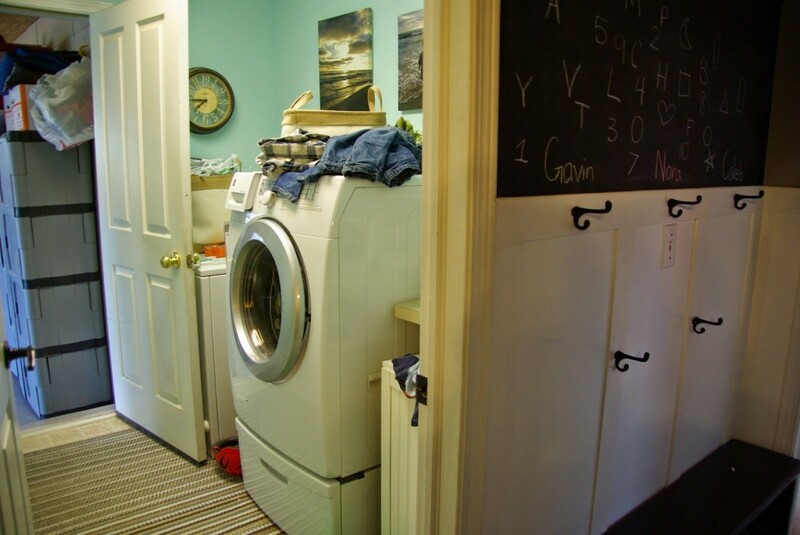 The laundry room is the way we get in and out of the house, through the garage. Got that? This corner has gone through some major transformations. It was always a wasted space. With it being right off of the garage I decided to use that space to hang coats. 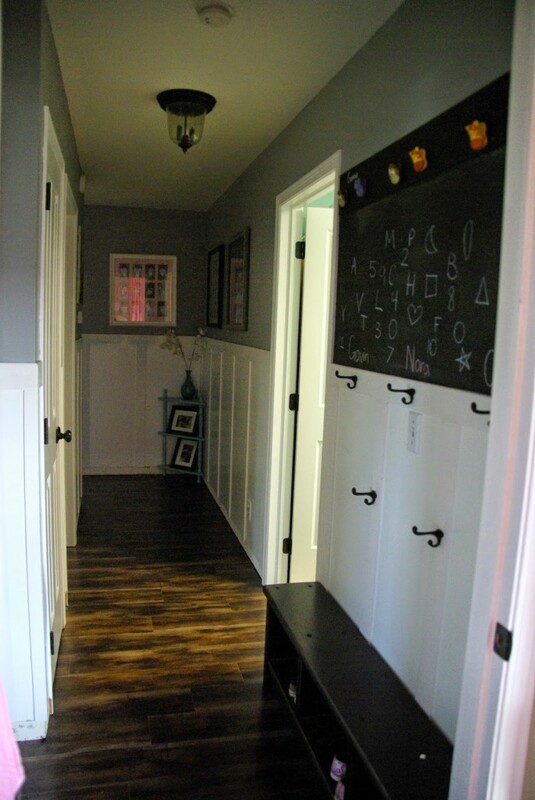 We did the board and batten ourselves throughout the whole hallway and entryway. 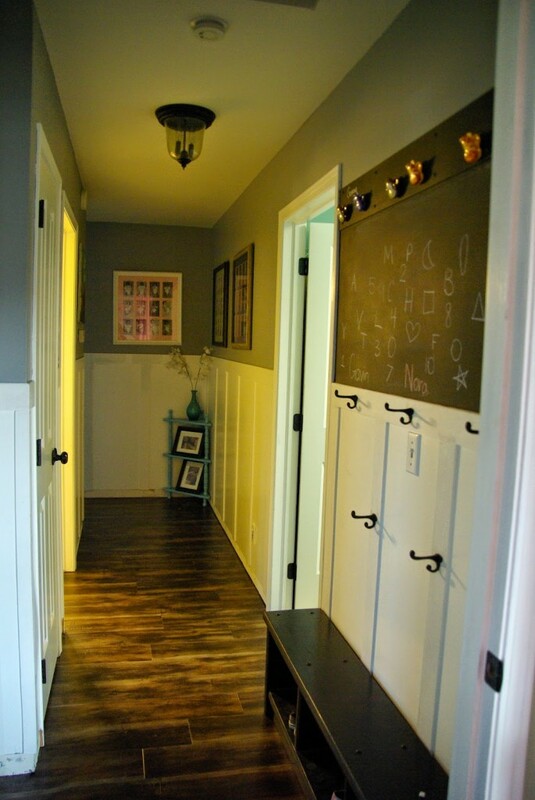 To do this look in your home the board and batten is not needed. 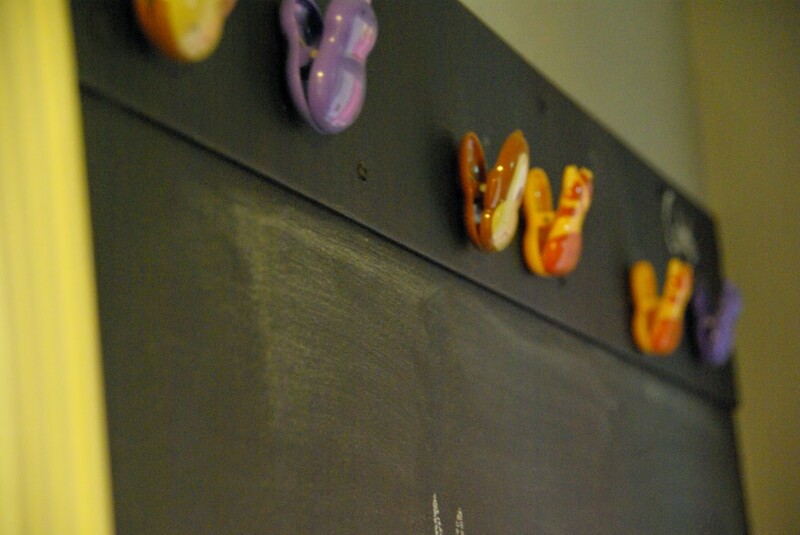 Just some hooks, chalk board paint, and a bench. This is what this area looked like when we first moved in. This shelf was a CD case holder, remember those? 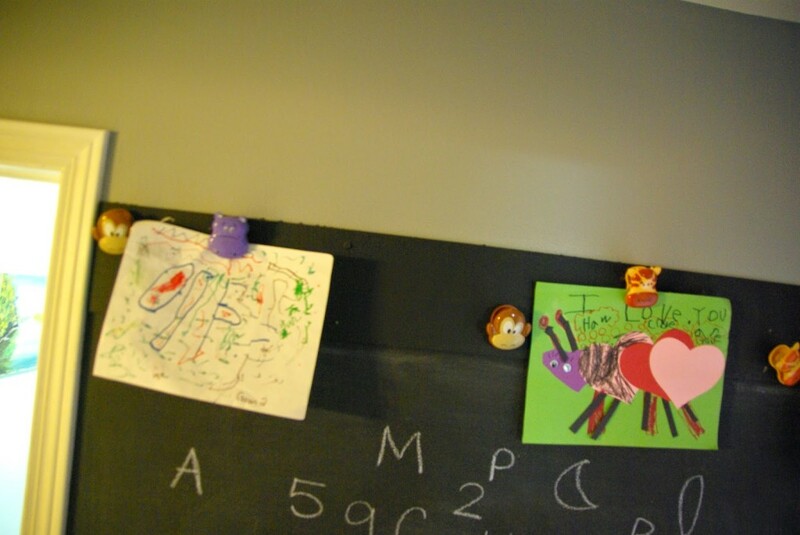 The kids birth samplers made by family was hung here since it is by the kids rooms. It was sort of a throw away, or walk right on by corner of the hallway. Not functional, or that pretty to be honest. The space looks very different from the before picture. 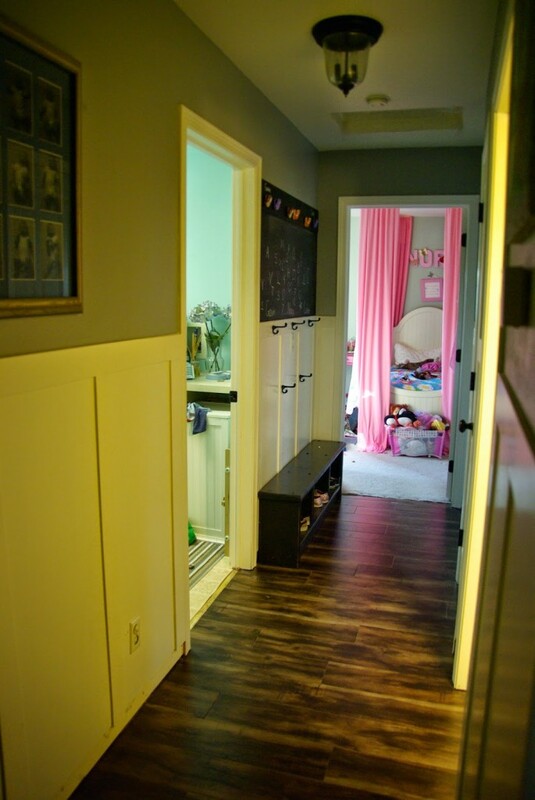 From this picture we have added board and batten, painted the wall a dark gray, painted the trim white, added wood floors, changed the door handles to oil rubbed bronze, and lighting. You can’t see it but the lighting is all different in the hallway now. This is not a tutorial post on the board and batten. That is on my to do list, and when I saw to do list I mean forcing my husband to tell me all of the nitty gritty details. He is the man. 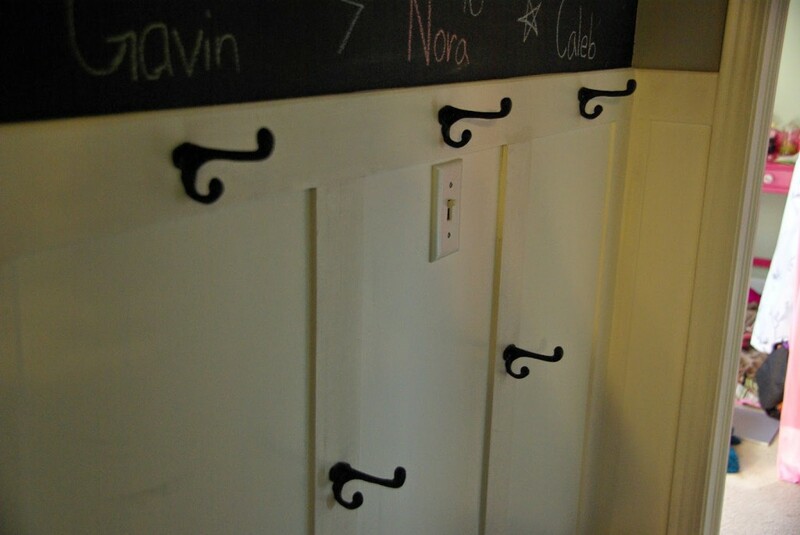 But once the board and batten was up (which is not needed to make a backpack/coat organizer) I started with the hooks. 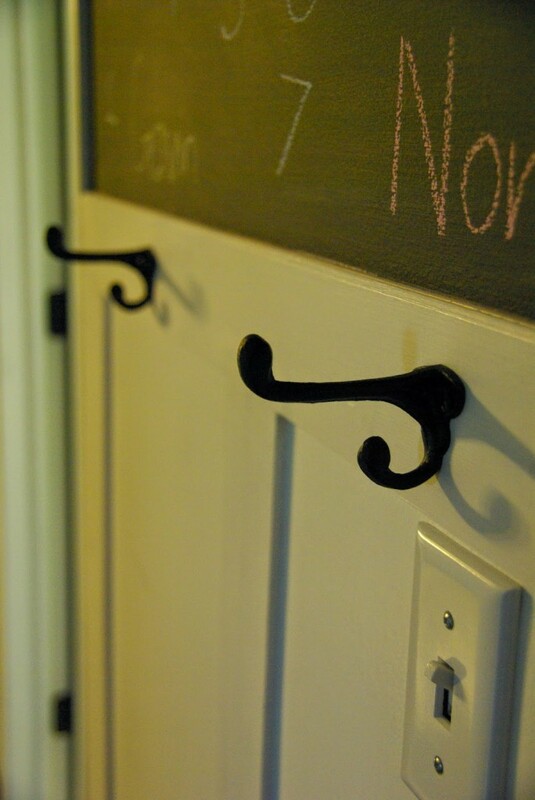 I purchased the hooks from craigslist. They were really old and worn down. They were black but a lot of it was rubbed off. 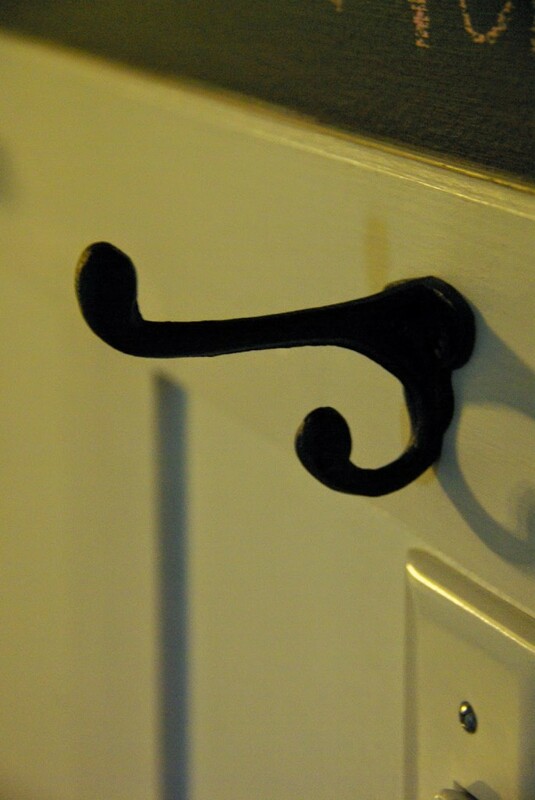 I quickly used a hard bristle brush to rough up the hooks. Then spray painted the whole thing black. Bought some screws to fit in the holes, since they came with none. I spaced them out to align with the board and batten. 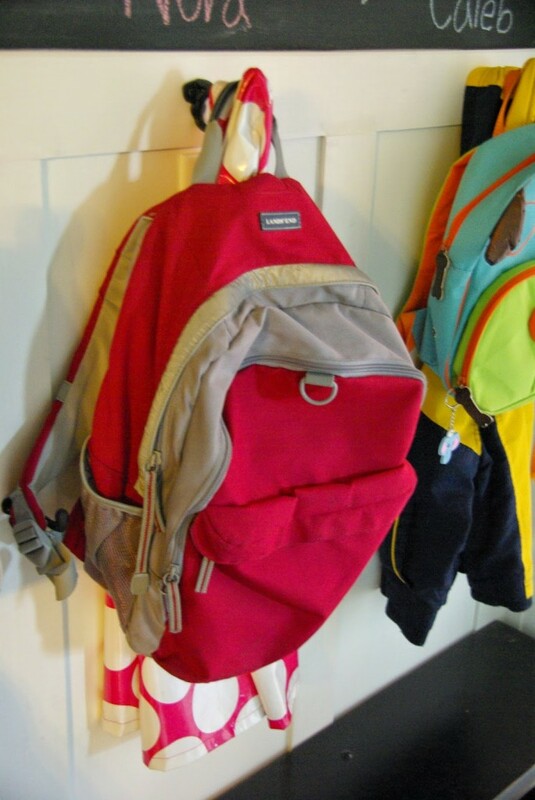 But if you are attaching to a wall use a light pencil mark, or a laser to make the hooks hang in somewhat of a line. I was only going to use the 3 even though it came with 5 but figured I could hang all 5 and they do come in handy. 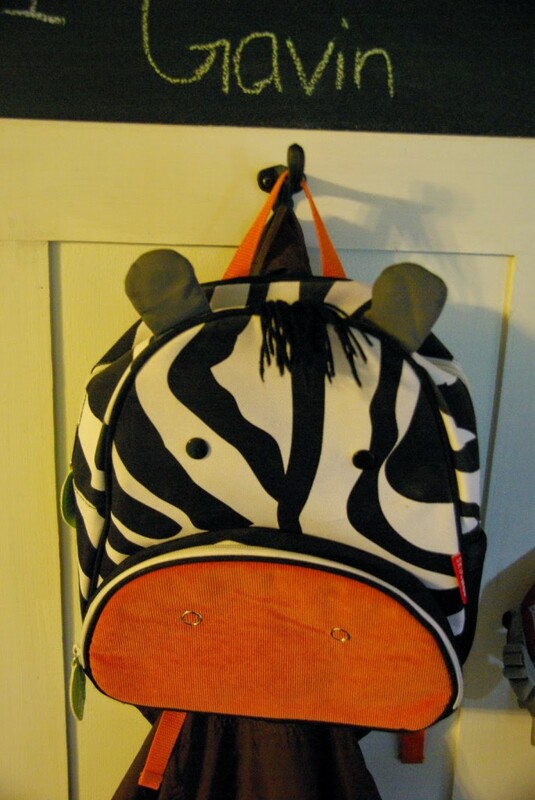 For lunch boxes, back packs, coats, or hats if the kids have a favorite of the week. 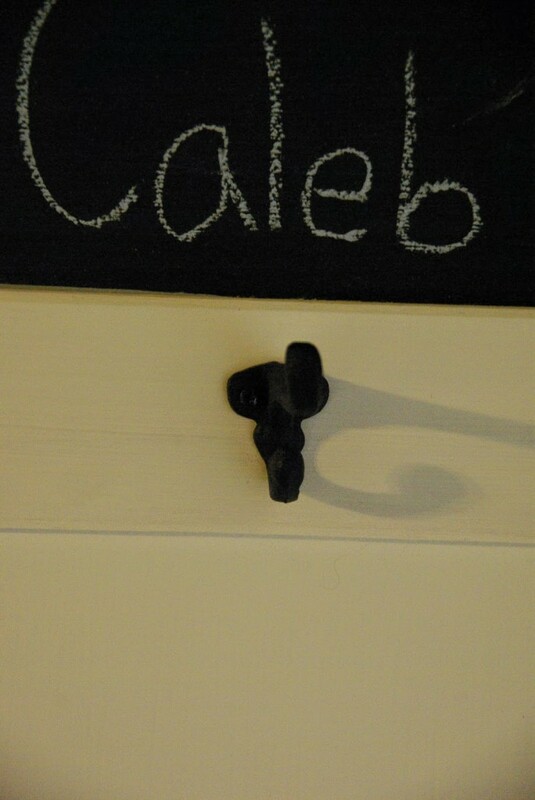 Next is the chalk board paint. 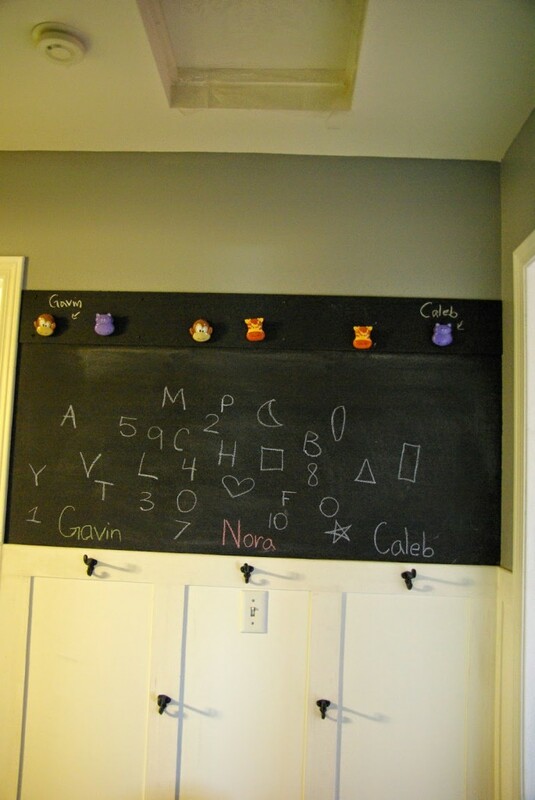 This is pretty simple, there is chalkboard paint you can purchase everywhere. We bought ours from Menards. You put it on like you would any other kind of paint. Waiting for it to dry between coats. I did three coats of this. The one thing to be sure about it WAIT 24 HOURS AFTER LAST COAT TO DRAW ON IT! It says this very clearly on the box and the can itself. But I figured the rules did not apply to me. I am a rule breaker. I am a DIY-er, I know paint. I drew in one corner after it was dry, maybe an hour later and the mark after wiped off was still there. It looked like I had tried to erase a chalk mark and it did not come all the way off. Learn from me and wait the 24 hours. We also have a piece of steel on top that my husband cut down to size using a cut off wheel. He had this steel laying around the garage because he is a hoarder :). No really he keeps everything “just in case we need it” Well we did, and even though this was a great addition to the corner here it was not great for the fact that this is more proof that he is right in saving everything. So win for him, win for the organizing corner, and lose for me because now my husband is right about something. Ok, anyway. There is magnetic paint you can pick up as well. 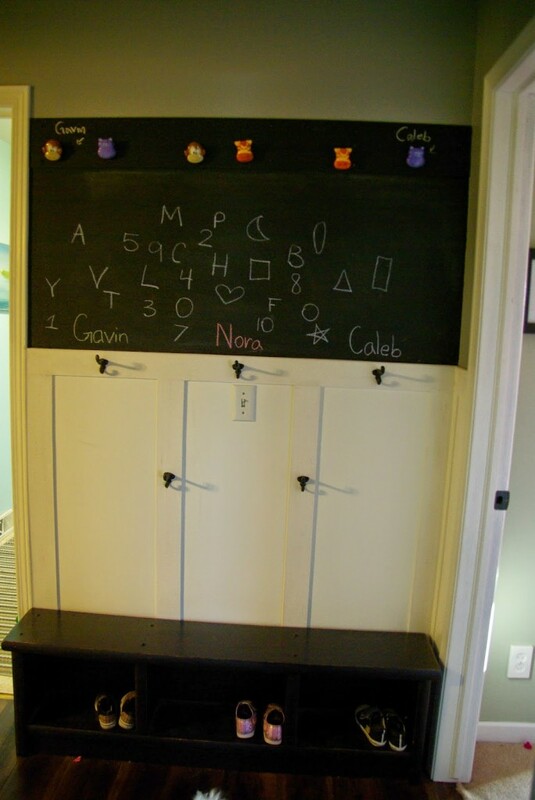 Also I have seen chalkboard paint that is magnetic which you can use too. We measured and cut the steel to run along the top of the chalkboard to allow important papers that the kids have to take in the morning to school, art work, notes, whatever. It is there to see. And it gave me a good excuse to buy these adorable little animal magnets with hooks from e-bay. I mean come on. My kids are only little once, I can only use this cutsie stuff for so long. At this point in adding things this little nugget of coat hanging was done. This is how it was meant to be….. until…. 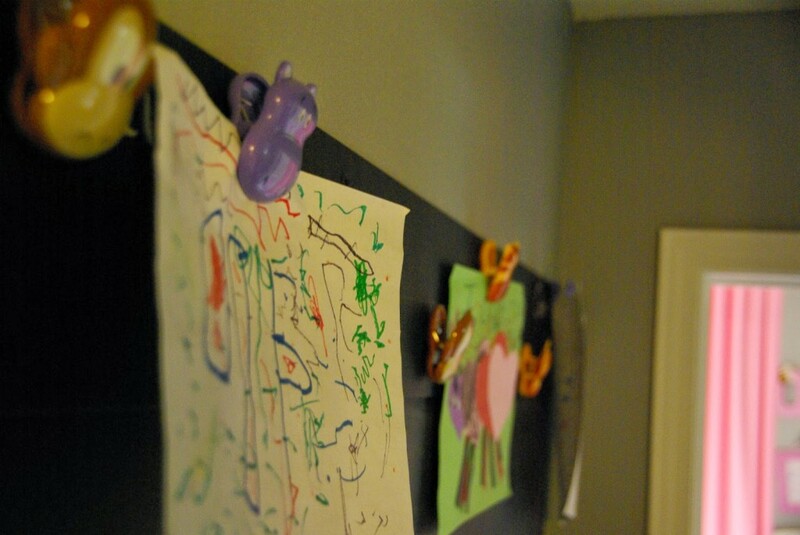 the I thought finished wall organizer, oh the suspense, what did I add?!!!!! Then we happened to be at a flea market. I know weird right? 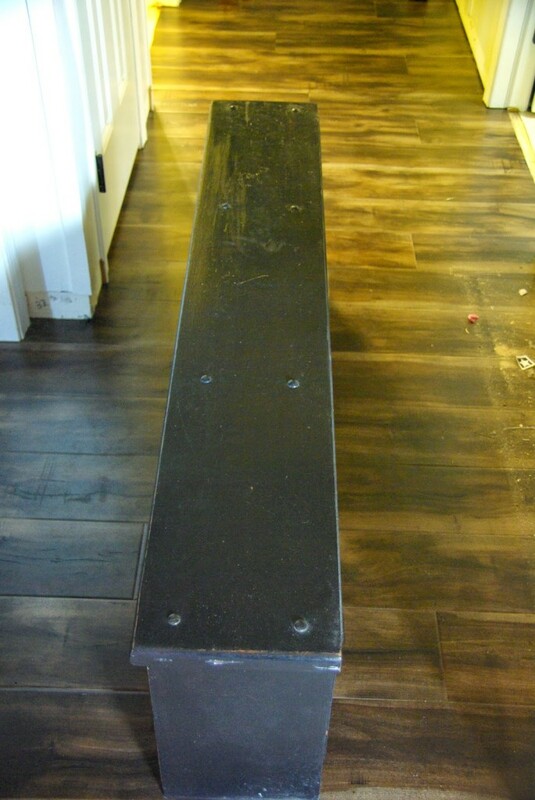 And there was this little black bench. It was long and skinny and had three little cubbies. I have three kids, and this has three cubbies. Can we say perfect. A match made in home decorating heaven. I did not know where I was going to put it. Well I had a hunch it would fit in this little corner of the hall but was not certain. I figured worst case scenario it does not fit there and I find another spot for this oh so cute and adorable bench with storage. Well I took it home and it fit perfectly. I am talking looks like we custom made it ourselves perfect. For you all who may be trying to make this happen at home any bench can be used. Also baskets at the bottom for shoes. Bins to put them in, wooden crates. 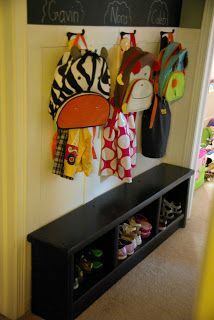 If a bench will not fit or you cannot find one any of those will be a very functional addition to make this space work for all of the things that kids use and put them under the coat hangers. Once the bench was done all that was needed was my kids clutter. 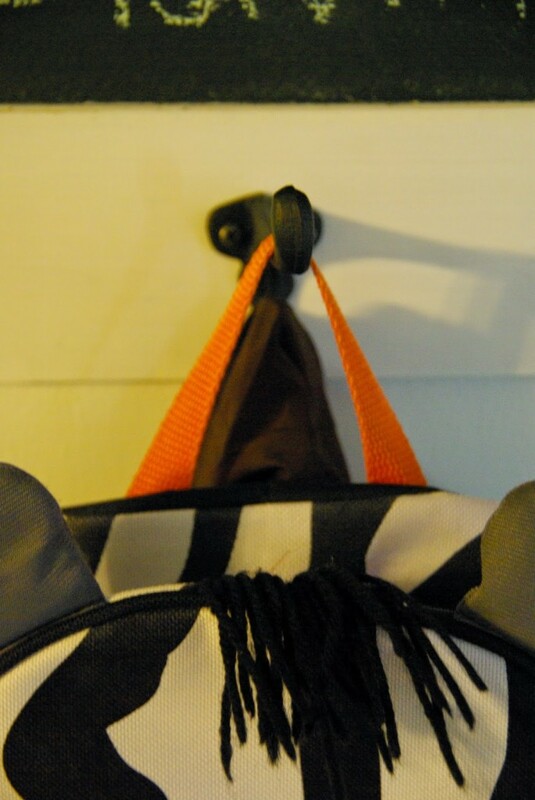 So there my friends is the break down of this backpack/coat organizer. 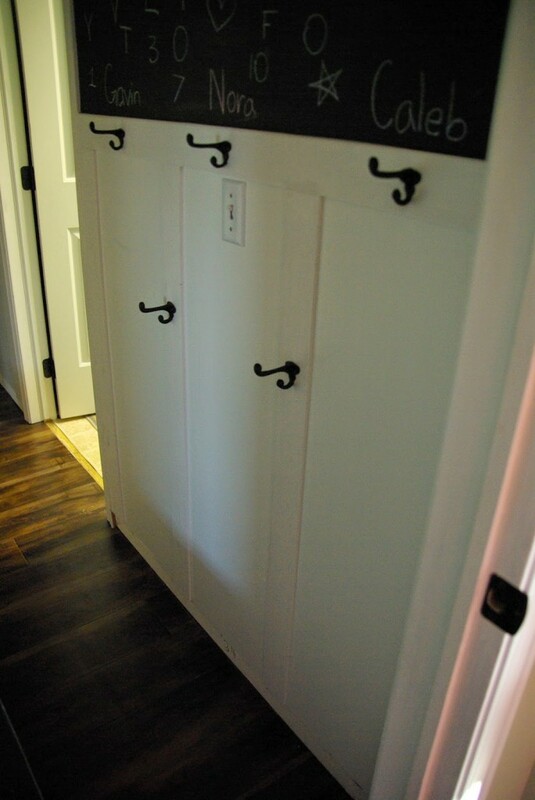 It is a sort of mud room without the room part. So more of the mud part. It is definitely functional and a much better use of the space. But is it that pinterest worthy? Who knows, yes I have a blog, and a Facebook and twitter now. Yay! But I am not the most streamlined and knowledgeable tech person. Or inter web person. I mean I still call it the inter web, come on. But those crazy pinners over at pinterest love their organization. Maybe it inspires them to organize their life. Or maybe it says a lot about my other content and that this is the best of the best. Time to do some self decorating reflection? Oh well, there you have it. 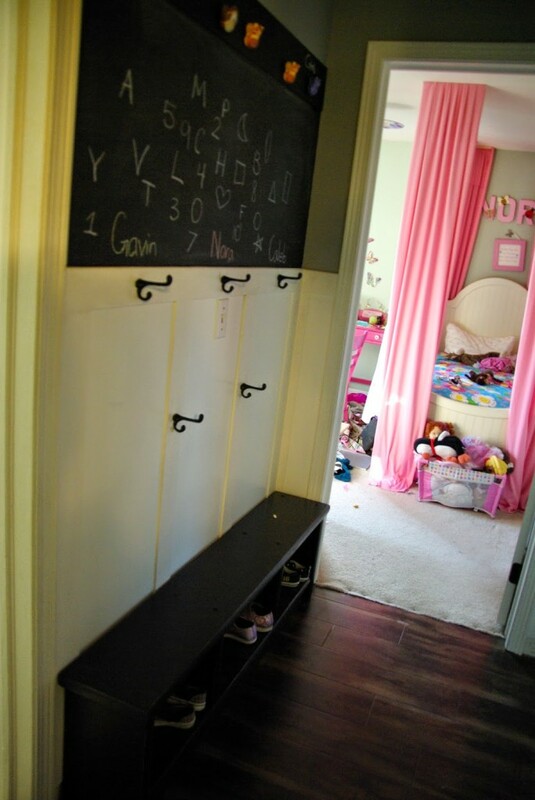 The full breakdown of this super cute, pretty simple, functional organizing center. 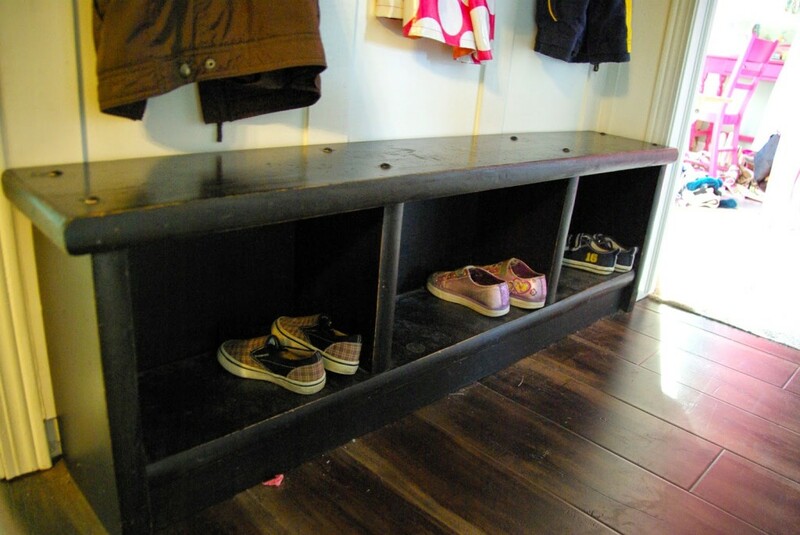 I know my kids little tiny feet with their little tiny shoes will outgrow putting them in this bench. And then I will add some chicken wire to the front a little and have them put winter scarves, hats and mittens in them. 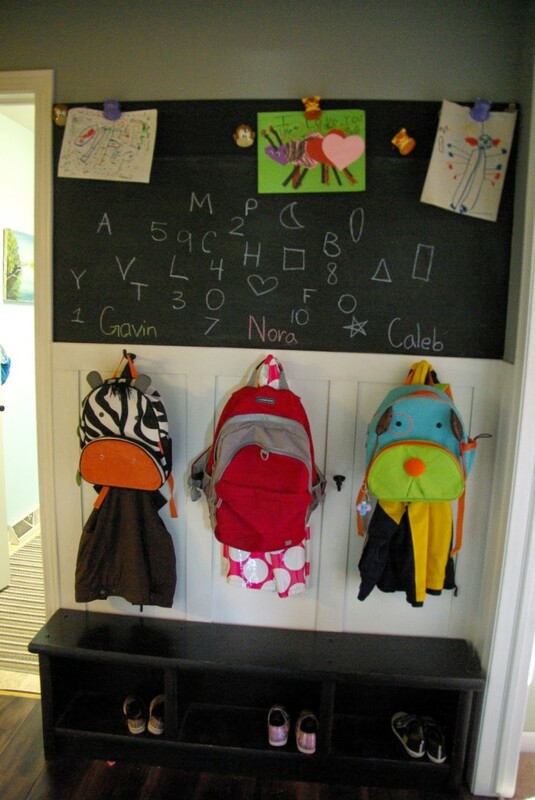 I will also have to check the chalkboard for illicit or mean spirited notes on more then one occasion I am sure. But maybe I can get them to still use the animal magnets? Come on a cute giraffe face, who does not love that? No self decorating reflection needed. I think it inspires them to organize their life, or least look like they have a very organized life to everyone on "the online". I think they should feel lucky to get to use the magnets I have never see animal magnets. Can I ask where did you get them? Or is that top secret? 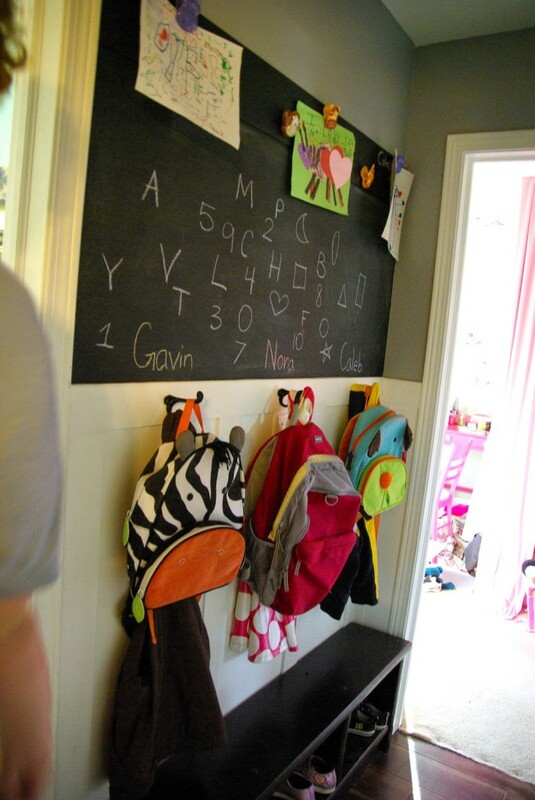 Love the project and great use of the space much better then the shelf to hold crap. Thank you so much. And it is very true about people being inspired to become organized. This little corner of my hallway is not always this organized I try. I got the magnets from e-bay. I am sorry I cannot be more helpful. And yes I think it is much better then the shelf to hold crap. Now it holds mounds of shoes and coats! Thank you, it is a great place to keep all of their things organized. If only I could train them to organize it that way now! Another great project! Marilyn from Merry Mondays stopping by to thank you for joining and hope to see you next week! So happy to take part in the link party, I enjoyed what everyone was sharing!